At the height of the Cold War, the US Air Force had dozens of fighter interceptor squadrons spread throughout Europe’s NATO alliance. This was the front line, standing guard against the ever-present threat of a Soviet attack The squadrons were organized under the formal command of USAFE — the United States Air Forces in Europe. For the pilots assigned to USAFE, it was an honor to serve. Only the best were selected for the duty. USAFE was a plumb assignment, carrying with it an extraordinary opportunity to travel. 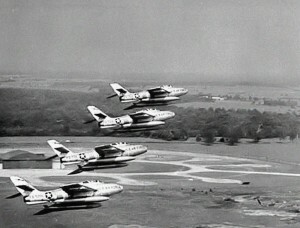 Families were allowed to deploy with the pilots and ground crews, making it an attractive posting. A little known perk of a USAFE deployment was the chance to get a set of handmade, perfectly crafted flight boots, a symbol of USAFE’s presence in Europe. At the time, the esprit de corps of the USAFE fighter pilots was symbolized in many ways. For example, F-104 Starfighter pilots had their ejection seat straps that hung off the back of their boots — these were called, “Starfighter Spurs.” Squadron scarves reflected their European deployments with exotic designs. And for any USAFE pilot there were the famed Hans Probst Measureboots — a precisely made, hand-crafted flight boot that they could wear with pride, perfect for flying a high performance fighter. “Flying boots, made of the best calf skin with zipper in the inside, leather or lamb skin lining. Double hand-stitched. Height about 9 inches. 22,–$” — so the Hans Probst advertising flyer proclaimed. Hans Probst started making boots in the mid-1950s for NATO pilots. By the 1960s, flyers advertising the boots were posted all around USAFE’s air bases in England, West Germany, and France. The Hans Probst company, located in Schöngeising, near Fürstenfeldbruck, in West Germany, was doing swift business for three reasons. First, the boots were extraordinary, each one hand-measured and then made to the precise size of the fighter pilot’s feet. Second, the “zipper on the inside” was a wonderful feature, allowing pilots to don the boots in seconds of hearing the call to scramble. And third, the boots were affordable enough to fit a fighter pilots pay grade, despite their extraordinary quality. 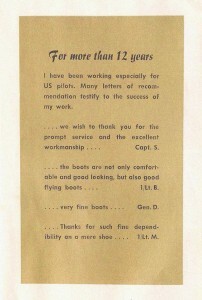 Detail from the entry for “Flying Boots”, the first item featured on the company brochure. The Measureboots were an extraordinarily good value — $22 equates to $162 adjusted for inflation to 2015. If made and marketed today, they would undoubtedly cost at least three times that much. Many pilots implicitly understood that Hans Probst was simply doing his part to support NATO. This point was highlighted in the company brochures, which proudly proclaimed that he had been making boots for USAFE pilots for over twelve years. 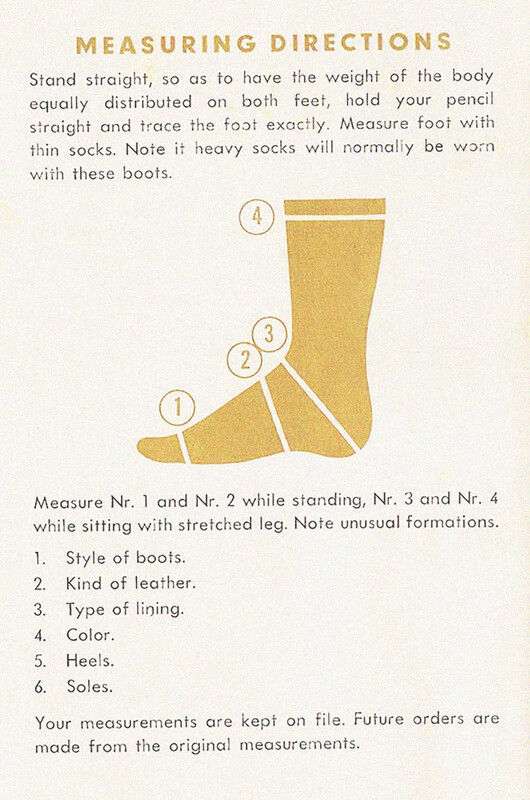 Hans Probst made other boot styles as well — including ski boots, ladies’ boots, mountain boots, hunting boots, and even boots for the Strategic Air Command (these didn’t catch on too well and they were also advertised for Army tank crews) — though these were a supplement to the company’s top listed boot, featured as #1 in the catalog, for fighter pilots. 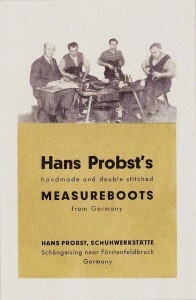 Pilots would quickly learn about Hans Probst Measureboots once they arrived in Europe. To join the USAFE club, the first call to make was to purchase a set of the best boots. Each pilot could take their own measurements and send them in. In fact, the company’s flyers showed precisely how to do that. However, ofttimes, Hans Probst himself would come out himself and make the rounds of NATO air bases to greet each newly deployed squadron soon after rotation. On the appointed day, the pilots would come in to Base Ops and get their boot sizes measured personally. 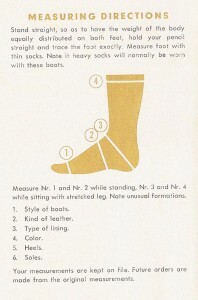 Measuring Instructions Sheet from the Hans Probst Measureboots Company. Four different measurements were taken — two while standing and two while sitting down. The first and second, while standing, were around the end of the foot, just behind the toes and then just in front of the bend of the foot to the arch. The third and fourth, while sitting, were taken from the bend of the foot to the back of the heel and then as a measurement around the leg at the top of the boot. This ensured that the boots would fit perfectly every time, including when a pilot was sitting in the cockpit of his jet fighter. The measurements were then recorded into the company files. 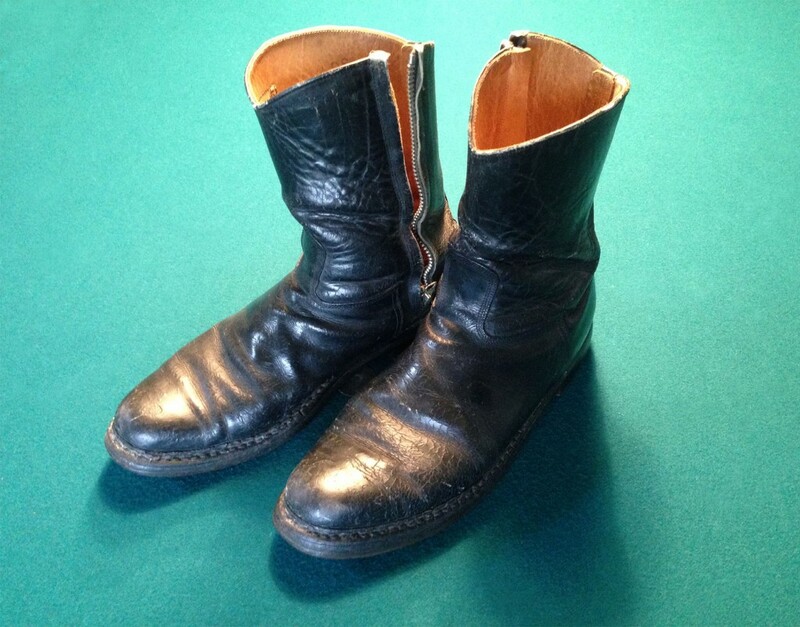 Thus, if another pair of boots was needed sometime in the future, such as to replace a damaged or worn out pair, Hans Probst could simply retrieve the data from his files and get to work filling the order. The quality of the boots was absolutely top notch. The leather was the finest “Russian Leather” — that unfortunate appellation (as viewed from the perspective of the Cold War). That term, however, denoted a type of leather tanning process in Russia a century earlier when tanners there perfected a leather treatment recipe that made the most of the quality of leather at hand. By the turn of the 20th Century, Russian Leather was famous worldwide. However, the “Russian Leather” process had been secretly copied and taken to Germany decades before. There, with the application of the scientific method, the process was perfected to set a new standard in the world — the term, “Russian Leather” meant German-made products using the secret Russian formula. Convenience factored in too, as the boots, once made, were delivered either to the air base or shipped directly to each fight pilot’s home address. When filling out the order form, the pilot’s address would be taken down for the records. Junior pilots, with lower pay and usually being unmarried, typically lived on the air base itself, so delivery was not a problem as the bulk of the boots would just be shipped to the base. Once they redeployed elsewhere, they could update their address. The higher ranking officers in the squadron — the squadron commander, ops officer, maintenance officer, intelligence officer, etc. — usually lived in rented houses with their families off base. Deployments usually lasted two or more years before they be rotated back to the United States or elsewhere. 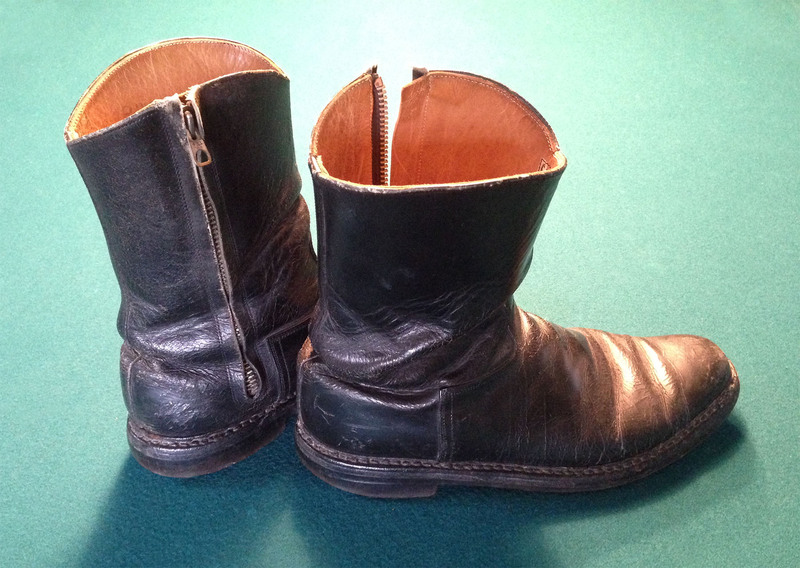 An actual pair of handmade Hans Probst Measureboots, formerly used in flying fighter missions in USAFE during the early and mid-1960s. Note the inside zipper and lack of laces. Once the pilots left USAFE, it was customary that they would take their Hans Probst Measureboots with them. The boots would then be worn whenever flying. They served as an ever-present reminder and symbol that they had been part of USAFE, standing the line in Europe against the Soviet Union. Besides the esprit de corps that the handmade boots represented, the most important consideration was their comfort. The leather was supple and perfectly formed. The boots hugged the pilot’s feet so perfectly that it was easy to simply forget that they were being worn. They were stylish and the easy to maintain. They polished up to a good military shine. The soles were good rubber and featured an excellent tread that gripped the surfaces of the ramp, runway, or hangar floor, even in the rain. The Hans Probst quality promise, illuminated in testimonials and part of their brochure. All good things must come to an end, however, and so it was with Hans Probst’s Measureboots. In 1967, there was an accident in which a USAF pilot ejected from his stricken fighter plane. Lacking steel-toed boots (perhaps he was in his Measureboots, though the record isn’t clear), he lost the tips of his toes when they impacted the bottom of the instrument panel. Back in the Pentagon, the Air Force Staff reviewed the accident and issued an order restricting pilots to official issue flight boots only. At least those boots had steel toes. It did not take long for the other NATO countries to follow suit. In a stroke, the era of the Hans Probst Measureboots had come to an end. 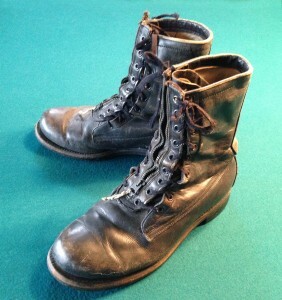 USAF standard issue flight boots from 1967-1968, after the end of the Hans Probst Measureboot era — note the addition of a front zipper for faster donning. 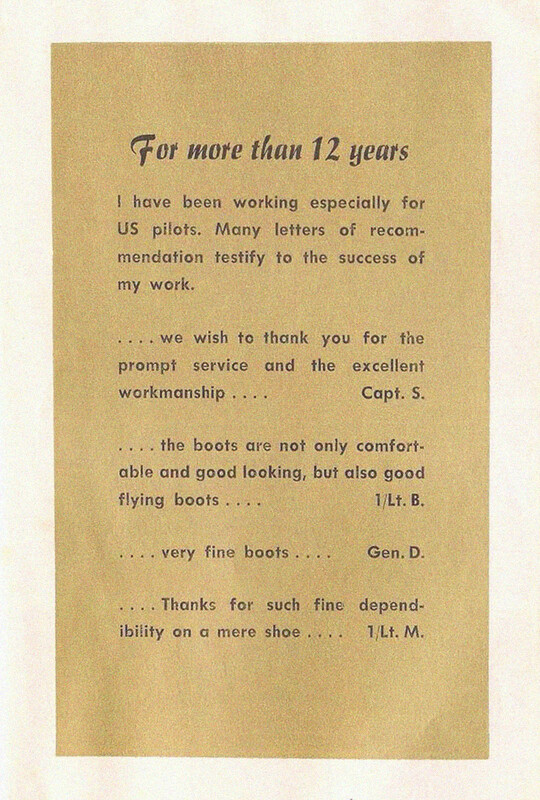 USAF pilots who still had pairs of Hans Probst Measureboots retired them and started wearing the uncomfortable, less well-fitting official issue boots. Within a short span, the Hans Probst Measureboots company, which apparently relied heavily on orders from NATO fighter squadrons, disappeared — exactly why is lost to history but one can surmise that the financial loss of a major segment of their business drove the business into obscurity. Ever since, across the USAF and around NATO, wearing standard issue boots has been the sole option available to fighter pilots. Such symbols of esprit de corps were replaced with squadron silk scarves and in the late 1960s by the “Party Suit” in Vietnam, which has a history of its own. That the USAF’s standard issue flight boots never measured up to the quality of the Hans Probst Measureboots is not surprising — it was a matter of cost and personal customization, i.e., exactly opposite the true meaning of the very term, “uniform”. Hans Probst’s Flying Boots were simply the best of the best, handmade to the exacting measurements of each pilot’s foot. Obviously, on such a mass scale, the USAF could never compete. Despite the improvement in safety, it was a loss to see the Hans Probst Measureboots go. Today, they are remembered fondly by the few, proud former pilots of USAFE who flew “back in the day”. Ever wonder why the boots were so cheap? Well, it just might have been because the cost of each pair was probably subsidized by the Soviet Union — at least that’s the case if there’s any truth to a story that emerged ten years ago at a USAFE squadron reunion (source name withheld on request). As former USAFE pilots can well attest, throughout the 1960s it was quite likely that NATO would have won the air war handily — if the Cold War had ever “gone hot”. From the Soviet perspective too, once the USAFE pilots were in the air, the outcome was viewed dimly. Finding this situation untenable, the Russians had to develop an unconventional plan to defeat USAFE. Their best answer came from the KGB, which planned to send assassination teams to kill USAFE’s pilots at their homes on the night before the World War III began. A problem with that dastardly plan, however, was that nobody knew the home addresses of the pilots, at least until they enlisted a spy at a little-known boot maker in Germany, where all the home addresses of USAFE’s fighter pilot leadership had been collected into company files for the taking. Thus, the outcome of the air war may not have been so cut and dried as it seemed at the time. The esprit de corps, the vanity of USAFE’s pilots and a little known boot company might well have combined to give the Soviets the upper hand in the air war after all — if only due to a well-placed agent at the Hans Probst Measureboots Company. A Final Note: This story is not intended to smear the good name of Hans Probst or anyone else at the boot manufacturing company, as the identity of the supposed agent yet remains unclear. Rather, this story highlights the challenges of the Cold War in the 1960s, an era when the world teetered on the brink of a nuclear Armageddon. Both sides would do whatever it took to win — from the ground (or boots) on up. The boots sound just like the Tank and Cavalry boots made by Dehner, but Dehner’s are made in Omaha Nebraska. Dehner had been making the famous tanker boots (calfskin lined) the exact same way as described for the Probst boots since 1937, when George S. Patton provided Dehner with the specifications. (They had been making cavalry officer’s boots since 1870.) Tanker boots differing by the use of straps rather than a zipper. 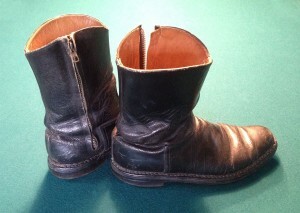 Dehner still makes them, along with the riding boots from which they are derived. Armor and cavalry officers (and some NCOs) of the U.S. Army never stopped wearing them. Dehner started offering them in tan rough-out with the beginning of the current unpleasantness. They are a bit more expensive than the 2015 equivalent of $22. But not three times as much. I had a pair made in 1967 when Hans visited our squadron in the UK. He would come through every year to get the new squadron members fitted. Every jock in the squadron had at least one pair. Then, as guys were reassigned to Thailand, Vietnam and Korea, the local cobblers there started to make copies, some of which were pretty good. I had several of the ‘knock-offs” made in Korea but the quality of leather was never as good as the “Russian” leather that Hans used. I have a pair of these, I found your page by googling the label on the inside of them. It made me smile they were custom made, I must share the same foot as this soldier. They are beautiful boots and fit so well and they do go on so quick. I hope I can get them recovered, my motorbike riding is damaging the left toe. I’m looking for a used set of flight boots in size 11 wide…. Or maybe a new set….